ADAM is the true story of a young trans person’s journey across borders and genders as he transitions from woman to man and journeys from Egypt to Scotland to find a safe space to call home. Conceived by National Theatre Scotland associate director Cora Bissett and written by Frances Poet, it’s a remarkable play about a remarkable person. The play is a two-hander between the real Adam behind the story (incredibly, Adam Kashmiry’s stage debut) and Neshla Caplan, who plays his female ‘alter-ego’ as well as a myriad of other characters. The production came about after Cora Bissett saw Adam tell his story on stage at a Scottish Refugee Council and Citizens Theatre event called ‘Here We Stay’. “It was his personality that really struck me,” explained Cora, who also directed Glasgow Girls. Chatting later, Adam admitted he didn’t realise who Cora was when she first approached him at the event. At first, there were no plans for Adam to act in the production. “I was searching for a middle-eastern trans actor, which was quite tough. I’d actually been Skyping a trans actor in Chicago when Adam got in touch saying he’d be interested in acting,” explained Cora. One of the most powerful moments in the play is when Adam types “can the soul of a man be trapped inside the body of a woman?” into his computer. “The searching moment is very true to life, that’s genuinely what I wrote” said Adam. “Then the world burst with all this information. I’d never heard the term ‘transgender’ before. For Cora, deciding how to portray the incredible moment where Adam realises he’s not alone was a challenge. “He was searching for an answer from the universe, and one came back to him. He found a community. 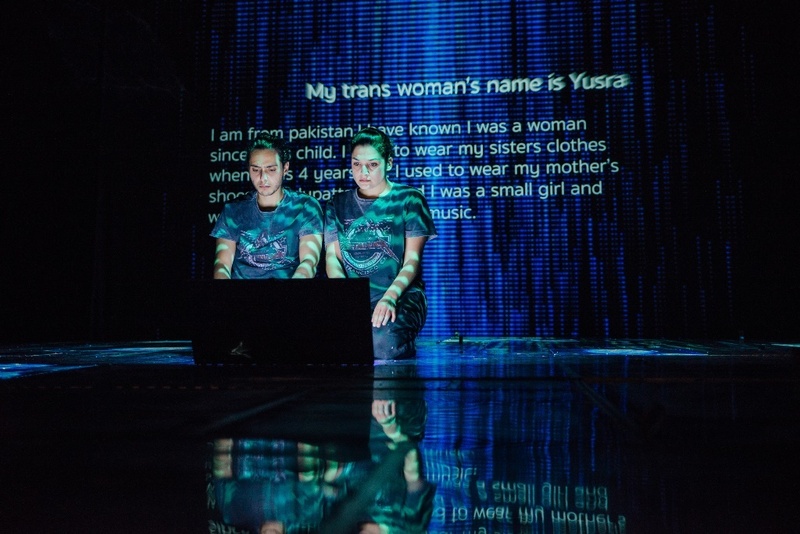 In a world first, Adam features a 120-strong, international digital world choir of trans individuals from across the globe. When the choir appears to Adam, it’s a special and completely unique moment that beautifully showcases how technology can bring people together. And, if you’re anything like me, it’s a moment that makes you weep. A lot. Both Cora and Adam are full of praise for Neshla Caplan, who fiercely plays Adam’s other self and together the two portray an inner, fractious turmoil between identities, gender and home. Reactions to the production have been unanimously positive, receiving five-star reviews and recently a Herald Angel award. “The reaction has been incredible,” said Cora. “It’s been met with such warmth”. “It’s been absolutely overwhelming,” said Adam. It’s grown my faith in people even more. Looking forward, Adam revealed that despite his initial reluctance, he’d now like to take acting classes and pursue an acting career. On the future, Adam said there is still a need for more support for LGBT refugees and asylum seekers. “I don’t judge anywhere for not being able to help me. Being an asylum seeker complicates things. It was quite hard to get the help I needed. “There is support for LGBT. There is support for asylum seekers. Not for both. “More support is needed in this area, not just advice. Some of these people might have had really traumatic experiences. They might want to share their stories or find people who have gone through something similar. “Asylum seekers and refugees can feel scared to come out. Cora said that when she pitched some story ideas to National Theatre Scotland, Adam was ‘unanimously picked’ because it was ‘engaging, digital, current and important’. It’s a play that’s timely and at it’s core quite simple – it aims to discuss complex and nuanced issues by really getting to know Adam and telling his story truthfully. It’s a five star production, the best thing I’ve seen in the Fringe, and has stayed with me since I sobbed through the standing ovation at the preview. Pauline Diamond Salim, media manager at Scottish Refugee Council said: “We had the privilege of getting to know Adam in 2013 when he took part in one of our arts projects to help refugees and local Scottish people get to know each other. To see him now, just four years later, perform on the stage of the National Theatre of Scotland is an amazing testament to his talent and resilience and to the power of the arts to make a difference to people’s lives. Oceana Maund, Scottish Trans Community development worker said: “Adam delivers a powerful, unflinching, sensitive and emotional insight into a world that very few will ever experience at first-hand. “I hope we can use that in a positive way. A book featuring the stories from some of the Adam world choir will be released in October in partnership with the Mental Health Foundation.